Welcome to the Darwin Archive! 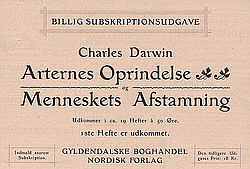 On this page you can find information about the reception of Charles Darwin’s evolutionary theory in Denmark in the years 1859-1920. Charles Darwin was without a doubt the most famous foreign scientist in Denmark in the years around 1900. On this page you can read about how the Danes received his theories. This site is aimed at anyone with an interest in the subject matter and is especially suited for students and researchers working with Darwin in Denmark. The Darwin Archive has been established by Interdisciplinary Evolutionary Studies at Aarhus University.